Hi I’m Annie, the brown eyed girl behind Love From Annie. I live with my very supportive partner Adrian (he has helped with many trips to the Post Office) and our little girl Molli who is 3 nearly 4 (chief prototype tester). We have recently moved to the Central Coast, NSW. We are in love with the weather and having fun exploring our new location. We’ve only been here a short time but already all three of us are on a first name basis with our local Post Office! I’m left handed but can do most things with my right hand as well. I love lollies, pavlova and feta cheese. I have always loved to create things and one day took the big step and decided to try and sell my creations and Love From Annie was born. I create handmade goodies for babies and children. 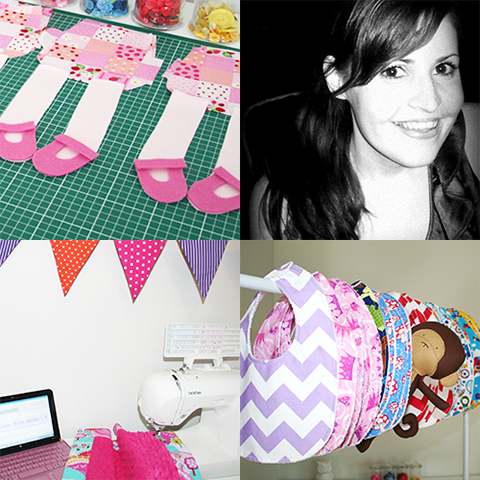 My main products are my bibs and bandana dribble bibs all hand cut and stitched together with my sewing machine. I also love to sew toys, softies and dolls, hand cut and made with a combination of machine and hand stitching. I like to use all different types of fabrics, felt, thread and ribbon. When selecting fabrics I’m drawn to bright colours and fun prints, I also have a soft spot for cute animals. Lately I have had fun experimenting with different fabric textures like chenille and minky. Behind the scenes I have been working on wooden blocks and puzzles to expand my toy range, this has included a fun new selection of materials to work with; timber, power tools, sandpaper, glue, paint and sealers. Fabric itself would be one of my biggest inspirations. Sometimes I will fall in love with a print and just have to have it not knowing at the time what it might become, other times I will look at the fabric and straight away picture the end result. Sometimes I will walk into the sewing room and see my fabrics all lined up on the shelves and find the perfect combination for what I want to create next. My little girl is also a big inspiration, she often puts in requests for particular toys and dolls that I know other little ones will love too. Now that she is getting older I am drawn to making more games and some educational pieces for my store, it’s exciting to be branching out a bit and fun to try something new, I look forward to seeing where it takes me. I also like to put myself in the customers shoes, what would I like to buy for my girl or give as a gift? I’ve always been a night owl and that is when most of my creativity and ideas will strike. Sometimes I like to work in batches other times I will work on one piece at a time. I do get easily side tracked and often have a number of projects on the go at any one time. I love to experiment and try new things, sometimes they work, sometimes they don’t but it’s all part of the process. My love for all things handmade began at an early age; finger painting, playdoh monsters, stick people drawings, lego mansions, mud pies, pasta necklaces, daisy chain bracelets, card houses and ice magic masterpieces! Over the years my passion for creating has grown; drawing, painting, knitting, sewing, crochet, sculpture, mixed media collages, pottery making, long stitch, cross stitch, lino printing, embroidery, baking and even woodwork! I loved art and craft at school, colouring in competitions, making goodies for the school fete and submitting creations for the exhibits at the local show. I would pull apart old sewing machines that were destined for the tip and somehow get them working again. I have wonderful memories of ‘Cousin Craft Days’ at our Nan’s place, there was always an abundance of glitter! My sister and I loved sewing lessons with our Ninna, which always included fresh scones for morning tea. Ninna’s sewing room was a gorgeous treasure trove of fabrics, trims and trinkets. We would sew all kinds of wonderful things, dolly clothes were our favourite! Many of the techniques she taught us all those years ago I still use today. Over the years I have always loved to give handmade gifts. When I was really little I would create something special and include a card for the recipient with ‘Love From Annie’ written as neatly as I could inside. Being so young at the time I would slowly sound out each word to make sure it was right. I still catch myself saying it in my head to this day and visions of all the handmade goodies I had created come flooding back. When it came to deciding on a business name I brainstormed a bit but nothing really stood out or felt quite right. I think I knew all along it had to be ‘Love From Annie’. It was a perfect fit. Every item I make is made with lots of love and when I think of my business name I love all the special memories that are behind it. I love crafty websites and blogs, that’s how I first discovered madeit, they are full of all sorts of wonderful tips and tricks. Trying a new technique recently I couldn’t work out where I was going wrong but after a quick search I found a very helpful YouTube video that pointed me in the right direction. I have a growing collection of vintage craft books and magazines that I love to flick through. When we are on long trips I often bounce ideas back and forth. I have found the madeit sellers facebook group and a number of sewing groups to be valuable resources, full of like-minded crafty and artistic people who are very encouraging and supportive of each other. Jump in and go for it! I put it off for ages, thinking I wasn’t ready, maybe no one would like my things but after some gentle nudges in the right direction from family and friends I got my store up and running. I listed my first couple of items late one night, feeling very nervous and not sure I was doing the right thing. To my complete surprise 20 minutes later I had my first sale! I couldn’t believe it but it gave me a much needed little boost of confidence and I have loved developing and growing my store ever since. Try to be as organised as you can it will ensure everything runs smoothly and give you more time to create. Make sure you have adequate supplies on hand. I like to buy my packaging in bulk and my supplies through wholesalers so I always have a stash ready to go. I often sew my bibs in batches, so when orders come in they are ready to post and if creativity strikes I have the time to work on new items or one of a kind pieces. Use descriptive titles, try to think of what words people might type in the search bar to find that type of product. When writing your product descriptions try to think about the type of questions potential customers might ask about the item and include that if you can. Describe your product as if they can’t see it or have never seen it before. Great customer service is a must! Do everything you can to ensure they have had a wonderful shopping experience. There are some really great websites dedicated to helping small businesses flourish, full of helpful ideas. Most have newsletters so you can sign up and stay up to date and apply little bits to your store here and there. I have found the more time I put into my little biz the more it has grown. And most of all work hard but love what you do! I enjoy the whole process from selecting supplies, to creating and perfecting each item, the thrill when I receive an order, packaging the items ready for their new home and even the trip to the Post Office, it is very rewarding every single time! Word of mouth has been fantastic and really helped my store to grow, I think great customer service really plays a part here. I have lots of wonderful return customers and their friends. I always pop a business card in with each order, they might like to keep it for future reference or pass it on to a friend. Keep some cards in your handbag or wallet, I’ve had conversations about my madeit store in all sorts of places and they come in handy. Take advantage of social media, it’s a great way to get your brand out there. Lookout for magazine opportunities or even approach your local paper. The Gift Guide and web adverts available here on madeit will get you noticed and spark interest. Use the best photos you can (photography is something I am still working on) they need to grab attention, this will not only led to sales but you may be selected for features on the front page, shopping guides, newsletters, other websites and blogs and shared around facebook. If possible try to list your products at all different times that way you will reach a greater audience, I always save some for late at night as that has proved to be a great time for my WA customers. I’m lucky to have not had any major issues along the way just some of the usual trial and error type situations. Sometimes just a short break and fresh eyes will make a big difference. Make sure you are familiar with postage prices before you sell anything. My first couple of orders were way off thanks to me just ‘guesstimating’. I now have it down to a fine art! Always measure twice, cut once! I have recently caught the running bug! My sister and I completed our first City2Surf run this year, raising money for the Breast Cancer Network in memory of our mum. We had such an amazing day, a funny thing to say after running 14km but it really was so much fun! The day after City2Surf I registered for my next run, a 10km run in November. I worked out a training plan and have really enjoyed my regular runs ever since! I also love to shop! Any kind of shopping – fabric and supplies, clothes, bags, shoes, accessories, furniture, gifts, you name it! As a family we love to cook up a storm in the kitchen, go on road trips, build sandcastles and lots of other fun things. Music – I’m one of those crazy people that enjoys nearly every type of music. I particularly love songs that I can sing along to or even have a dance! I usually have the radio playing in the background while I sew. Television – My big secret is out I love reality tv! I also like sitcoms. Film – I have far too many favourites! I have a huge movie collection and I think if I wasn’t a handmaiden I might like to be a film critic or screenwriter. Books – I love classic novels and autobiographies. I’m also working my way through Oprah’s Book Club Complete List of books. A trip to Disneyland! It really is the happiest place on earth! Ginny Renders - Gorgeous handcrafted jewellery, every piece is on my wish list for Christmas!